What Dentist Near Me Understands Sensitivity To Hot & Cold? Your teeth are sensitive – and they’re becoming more painful with each day that passes. It seems like even warm foods like oatmeal bother you, and it’s difficult to drink your morning coffee. You know it’s time to do something about the discomfort, but you wonder, ‘What dentist near me can treat my sensitive teeth and explain why hot and cold temperatures bother me?’ Luckily for you, the team at Trinity Dental, your premier dentist in Zionsville, gives you the information you can trust on sensitive teeth in this post. Microscopic holes in the tubules that are located in the inner layer of the tooth. Enamel erosion and tooth decay. Cavities or cracks in your teeth. Oral abscesses that may be developing beneath the surface of your teeth and that are unable to be seen with the naked eye. Receding gums that expose sensitive dentin to hot and cold foods and beverages. Broken dental restorations like fillings or crowns. What Can I Do If My Teeth Are Sensitive? Switch to a sensitivity focused toothpaste and avoid whitening products. Use a soft bristled toothbrush and use extra gentle pressure when brushing. Avoid acidic foods like tomatoes, limes, lemons, grapefruits, coffee, alcohol, and sodas. See Dr. Julovich for a professional exam to determine if you have a cavity that is causing your sensitivity. If the pain doesn’t stop or becomes worse, you may need to consider root canal therapy. In this treatment, we’ll remove the infected tissue that is the root cause of your discomfort, and then restore the area to look and function beautifully. Use gentle pressure when brushing teeth. Switch to a toothpaste that is nonabrasive. Floss each time you brush. 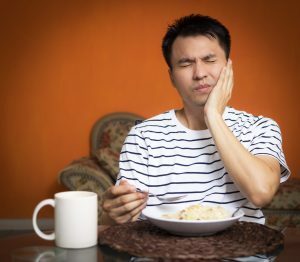 Now that you know why your teeth are sensitive to hot and cold, and how Trinity Dental can help, schedule your appointment today – we’ll take the pain away!